Religion NPR's stories on U.S. and world religion, spirituality, ethics, and moral issues affecting society and culture. Subscribe to NPR Religion RSS feeds. June 28, 2012  The Intouchables, a heartwarming comedy about a Paris aristocrat's friendship with the unemployed black man he hires as his aide, is an unlikely box-office hit in France. The film has produced an equally unlikely new movie star: Omar Sy, the son of African immigrants from a gritty Paris suburb. Are Women Worried About New Egyptian President? June 26, 2012  The Muslim Brotherhood's Mohammed Morsi is Egypt's first democratically-elected president after the fall of former President Mubarak. Host Michel Martin speaks with Rawya Rageh Cairo-based correspondent for Al Jazeera English, and masters student Yassmine El Sayed Hani about what Morsi's presidency will mean for women and minorities. June 25, 2012  Nigerian President Goodluck Jonathan fired his defense minister and national security adviser, saying the government needs new tactics to counter the militant Islamist group, Boko Haram. They have been blamed for sparking strife in parts of northern Nigeria last week. Host Michel Martin speaks with Al Jazeera English's Yvonne Ndege. June 25, 2012  In a part of America that was once claimed by imperial Russia, a unique combination of Native American and Russian Orthodox influences mingle in a graveyard. 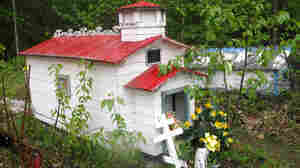 There, spirit houses are built to house the dead and ease their passage. 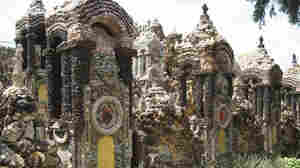 June 22, 2012  The Midwest is home to the largest collection of grottoes, or man-made caves, in the world. And the mother of them all — encrusted in $6 million worth of semiprecious stones — is in West Bend, Iowa, the life's work of a priest after he survived pneumonia. It turns 100 this weekend. June 21, 2012  The first minarets in Murfreesboro, Tenn., are about to be placed atop a new mosque. But when construction is done, no one will be able to move in — the latest development in a two-year legal fight over whether adequate notice was given for a public meeting that approved the mosque's construction. June 20, 2012  The effort, dubbed "Fortnight for Freedom," will involve praying, fasting and rallies against what the Catholic bishops call an assault on religious freedom by the Obama administration. But parishioners worry that the movement is splitting the church. Does Sparing The Rod Spoil The Child? June 19, 2012  Many religious parents use the line, "spare the rod, spoil the child" to defend corporal punishment. That rationale was put in the spotlight when televangelist Creflo Dollar was arrested for allegedly assaulting his daughter. Host Michel Martin asks three prominent faith leaders — and dads — whether the saying still rings true in churches. 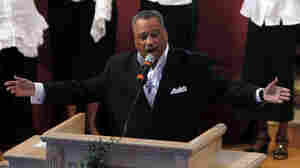 June 19, 2012  Fred Luter, a former street preacher who turned a dying New Orleans church into a powerhouse, is set to become the organization's first black president. 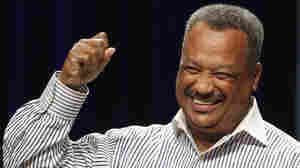 June 19, 2012  The Southern Baptist Convention is expected to elect its first black president on Tuesday: Fred Luter, a former street preacher who turned a dying New Orleans church into a powerhouse. His election is a milestone for the 167-year-old denomination at a time when minorities make up a growing share of a shrinking membership. June 18, 2012  When anti-government demonstrations began last year, the Rev. Paolo Dall'Oglio supported the young Syrians calling for democracy. 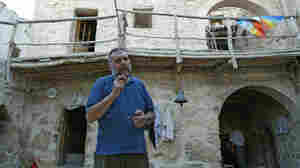 During his three decades in Syria, the Italian Jesuit priest helped restore an ancient monastery outside of Damascus and promoted Christian-Muslim dialogue. 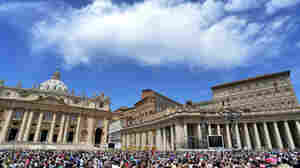 June 15, 2012  U.S. Catholic bishops are wrapping up their annual meeting in Atlanta. 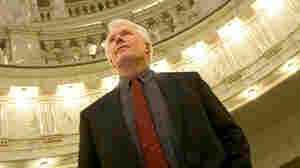 They vowed to continue fighting the Obama administration over contraceptive health coverage. Plus, ten years after sexual abuse scandals were revealed, the bishops assessed whether they're doing enough to protect children. Host Michel Martin speaks with two religion reporters. June 14, 2012  The evangelical radio host recently made national news for leading an attack against Mitt Romney's openly gay national security spokesman, who later resigned. But Fischer's viewpoints on abortion, gay marriage, education and taxes have been influencing his listeners long before this. 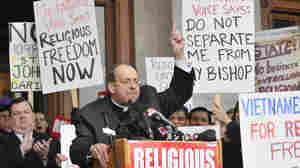 June 8, 2012  The Franciscan friars of the U.S. have expressed support for the Leadership Conference of Women Religious. The organization which represents most of the country's nuns is the subject of a Vatican investigation. Audie Cornish speaks with Father Joe Nangle, of Our Lady Queen of Peace in Arlington, Va., about his order's decision to support the Sisters.